Was born in Sydney where she studied clarinet and saxophone at the Sydney Conservatorium of Music. She is currently based in Sydney again after some years in the USA where she performs and teaches classical, contemporary music and jazz improvisation. “Meanwhile, upthebackpaddock. . . Nos. 1 – 6,” are “seriously composed works,” yet also ironic and humorous. ”Meanwhile, upthebackpaddock” might be the Ozzie equivalent of saying, “Meanwhile, back at the ranch.” “Up the back paddock” is the rural location where some sort of trouble is likely to occur, some sort of mischief, or, possibly, something of a sexual or illicit nature. The words “up the back paddock” have been strung together not only to mimic colloquial Australian speech, but to reflect the relative compactness of these six miniatures. has enjoyed a distinguished career as a composer and music educator. She graduated from the University of Sydney with a BA Hons in Music degree in 1967 and subsequently, in 1972, from the University of York in England with a PhD in composition. She has held academic positions at the University of Sussex (1972-77) and at the University of Hong Kong, where she was the founding Head of the Department of Music (1981-1990). 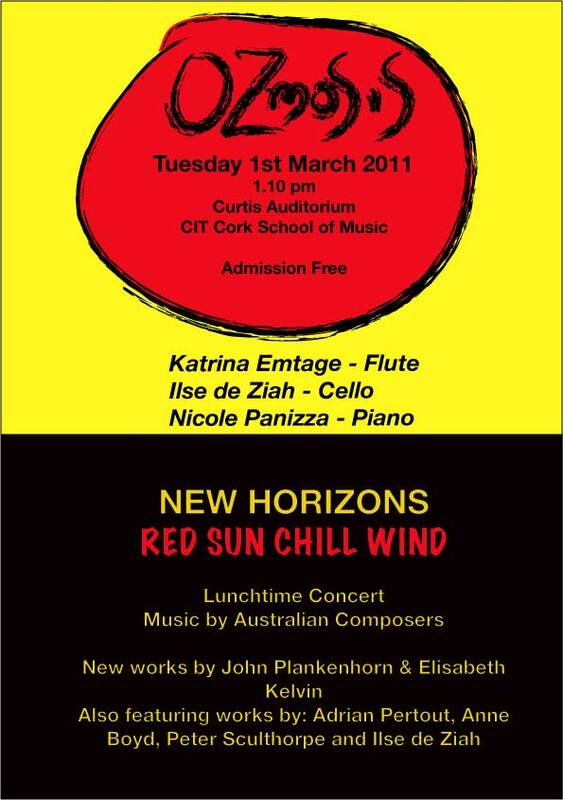 In 1990 she became the first Australian and the first woman to be appointed Professor of Music at the University of Sydney where her research work focuses upon the influence of landscape and of Asian music upon Australian composers. Her struggles to ensure the survival of this department gained international attention through the release of the award winning documentary Facing the Music (2001). Anne Boyd wrote her first compositions as a little girl growing up on a remote outback sheep station in Central Queensland where her only music teaching was via ABC Radio (especially The Children’s Hour’s Mr Melody Man) and a recorder book. Much later she became a student of Peter Sculthorpe and inherited through him a lifelong fascination with the musical cultures of South East Asia, especially Japan and Indonesia. She regards the ancient court music of Japan as a primary influence, the closest musical representation of the arid outback landscape of her early childhood. Composition is viewed as essentially spiritual and she is much interested in the idea of music as meditation, as a means of changing states of consciousness. Her music is based on the intersection of Christian Love with Buddhist silence. Boyds music is published by Faber Music (London) and the University of York Music Press. In 1996 Anne Boyd was honoured with the award of an AM in the Order of Australia for her service to Music as a composer and educator. In 2003, she was conferred Honorary Doctor of the University by the University of York (UK). Andrián Pertout (1963 -) was born in Santiago, Chile, and lived in Gorizia,Northern Italy for several years before finally settling in Melbourne, Australia in 1972. Over the years he has worked as a film composer, performer, producer, arranger and writer. In 2000, Andrián Pertout completed a BMus (Hons) degree, and in 2002, a Master of Music (MMus) degree with first class honours at the University of Melbourne, majoring in composition. In 2007, he completed a Doctor of Philosophy (PhD) degree at the University of Melbourne on Tweddle Trust, Australian Postgraduate and Melbourne Research scholarships, studying composition under the guidance of Brenton Broadstock. As an educator, Andrián Pertout has been a teaching composition and orchestration at the Faculty of Music, University of Melbourne since 2003. The Victorian College of the Arts has additionally employed him since 2006. In 2007, he also began working as a music engraver for the Lyre-Bird Press (Editions de l’Oiseau-Lyre), one of the world’s foremost publishers of scholarly musical editions. Over the years he has also worked for the University of New England, Charles Darwin University and the University of Western Sydney as composition teacher, supervisor and examiner. As a writer, he has published over 400 articles in music publications, such as Juke Magazine, Mixdown, Australian Musician, On the Street Melbourne, Music Trader, Spanish Herald, Drum Scene, Music Trader Online, Beat Magazine, 3rd Magazine, Metalshop Online and the Sunday Herald Sun, reviewing new musical technology, compact disc and book releases, as well as conducting interviews with prominent national and international artists including Herbie Hancock, Steve Reich, Joe Satriani, Mark Levine, Joe Zawinul, Melissa Etheridge, José Feliciano, among many. ‘Sonus Dulcis’ (2003 – revised 2008) or ‘Euphony’ is an exploration of the system of just intonation, or pure intervals (whereby “frequencies of the individual tones reflect the precise mathematical proportions that occur in the harmonic series”), and therefore attempts to avoid sequential intervals with non-superparticular vibration ratios. Its pitch material features the Japanese ‘In’ scale – essentially a hemitonic pentatonic scale incorporating two auxiliary tones. 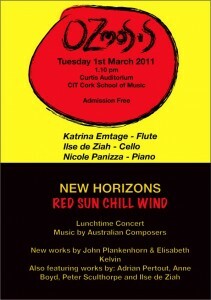 This entry was posted in Concert, programme notes and tagged Australia, australian, cello, contemporary, flute, music, Ozmosis, piano. Bookmark the permalink.